The picturesque little town of Dalkey is a short DART or bus ride from Dublin city center. It’ s one of my favorite little towns in Ireland… the architecture is beautiful and the harbor is full of life. Watching the seals play is always a treat. …with a typially Irish sort of street pattern. Dalky has a cool nooks and crannies everywhere… here’s a place with one-person offices to let. And Dalkey also has two little harbors. The seals like to play in Dalkey Harbor. 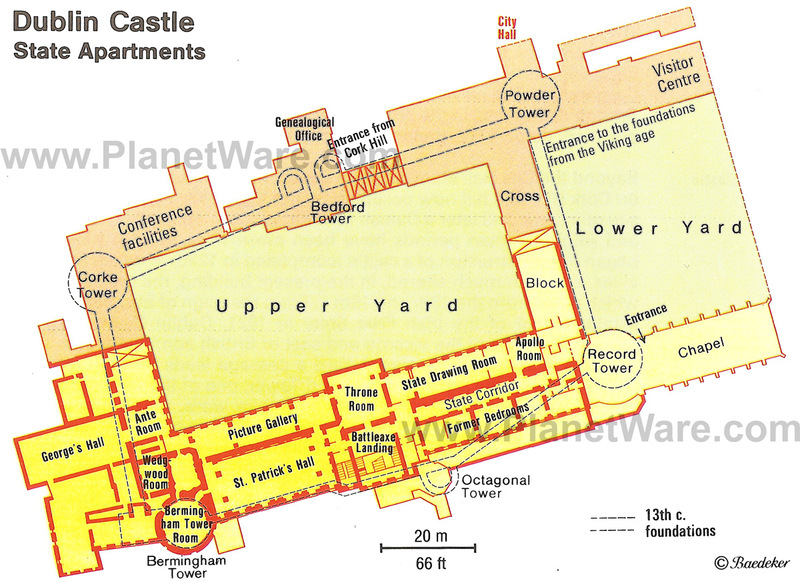 Here’s what Dublin Castle looks like…. Fulbright events were held in the Throne Room, Picture Gallery, an St. Patrick’s Hall. The 2013 Fulbright scholars banquet was a rare treat. We dressed in gowns and tuxes and dined at Dublin Castle. I didn’t get the greatest photos, but my snapshots provide a glimpse into the festivities…. …with new Fulbright and their families. …Joanne Davidson stopped to chat with guests. We were greeted by the official O’Brian-Moran welcoming committee! …in a fancy hall with a throne (which, somehow, I failed to capture). The list of my table mates. Like Nancy, Noel and Alan. I always enjoy seeing Nancy, who was Fulbright and is now a Curie scholar. …as there’s no A/C in Ireland. We settled down at our tables. And I enjoyed the company of Patrick, Alan, Noel, and the rest of our table mates. Trinity’s Dean of Undergraduate Studies was a hoot once we broke the ice. And the overall setting couldn’t have been grander. Many thanks to Daisy for inspiring me to draw so much on my trip to Rome… we have always been very productive at sketching when we travel together. In this post, I’ve included photos of one of our many dinner outings. On my last night in Rome, Daisy and I headed over to Trastevere–stopping for a glimpse of the basilica (dedicated to Santa Maria, where mass was in session) before heading on to our favorite dinner spot. As is generally the case when Daisy and I are traveling with architecture students, we brought our sketchbooks along to discuss. I’ve included photos of Daisy’s beautiful work, that caught the attention of our waitress. She studied every page! Daisy’s area of expertise is architectural representation, as is evident in her drawings! Mine, on the other hand, is educational research… that’s what I presented to Daisy’s students in the lecture I delivered. As a result of our exchange, I woke up inspired to draw on my last day in Rome. It was hot, hot, hot, though. I had to sketch quickly to keep ahead of the heat! By the afternoon, the sky opened up and the rain poured down. Thankfully our fore bearers built plenty of sheltered spots in Rome that have lovely views! I made three sketches on my parting day–two are shown below. and the doors were open to celebrate mass. and her drawings fascinated our waitress. What a gorgeous pen drawing of the monument to Victor Emmanuel. And when I noticed rain was on the way, I headed to the courtyard designed by Bramante, adjacent to Santa Maria della Pace. 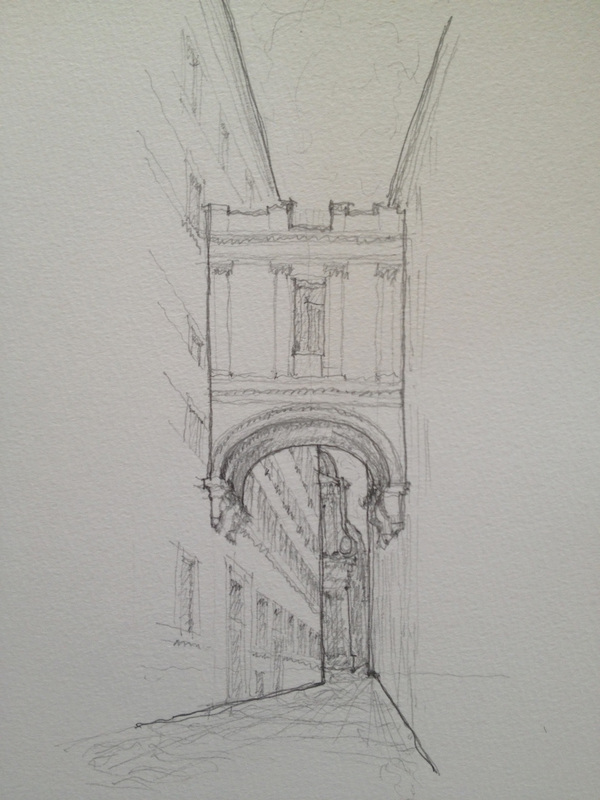 I made my last sketch in Rome, for this trip, under the shelter of Bramante’s cloister. I’m wrapping up my week as “Scholar in Residence” for the University of Oregon’s study abroad program in Rome. It’s been a fun and informative learning experience. I’m posting images from the studio review we had on Thursday, to give you an idea of what it’s like to be an architecture student or professor. These students have completed second year of a five-year professional degree program (leading to the Bachelor’s of Architecture degree). They will start third year in the fall. They’ve done some very nice design work so far in their three-credit architecture studio class in Rome. Their site is an embankment wall, built in the late 1800s to keep the Tiber River from flooding the city as it has done for centuries. Drawings by a student in Daisy’s class. …using the concept of frames. …and she drew a helpful perspective of the new design. Miranda explaining the research, precedents, and conceptual underpinning of her design. Laurel presented her ideas, too. Headed out for breakfast and a day of exploring in the breeze and sunshine of Rome. Yesterday’s rain cooled the city down, and it’s amazingly comfortable today. Hoping to get some more sketching in today. After sketching yesterday morning, I spent almost all of the day editing the article we hope to have published in the Journal of Engineering Education. The chapter is a very timely, central and relevant chapter for Springer vol II. It would also have fitted nicely into vol I section I. The chapter has a clear, logical, and coherent structure, is well written and very interesting to read. In particular in clarifying the confusion surrounding the engineer and engineering technologist distinction the chapter provides new and useful insights. Moreover there is a good integration between theoretical positions mentioned in the introductory framing of the identity issue and the remaining part. Research problems and methods are clearly stated. I nearly got clubbed by a Roman! The chapter is accepted for publication in its present form. Congratulations. Your chapter is very good and there is absolutely no reason to change anything. My congratulations to you and your co-authors. Well done. These messages were a dream come true! They helped keep me focused through many hours of editing yesterday. At 4:30 PM, I headed out for a tour of the Villa Farnese, a sandwich and ice cream (I hadn’t eaten since breakfast), and a little stroll through the city. I haven’t shown it here, but I strolled past the site I often use for projects with my Hampton University students. There’s been construction activity on the site for the past two years, because a parking garage was planned. For years, they’ve been excavating here (because there are Roman ruins under the ground everywhere here and they have to study and document them). The signage surrounding the site is now different from it was last summer and last September (when I last visited). I’m hoping this change means someone important decided against installing a parking garage; it would be a travesty to put such a structure on Via Gulia! 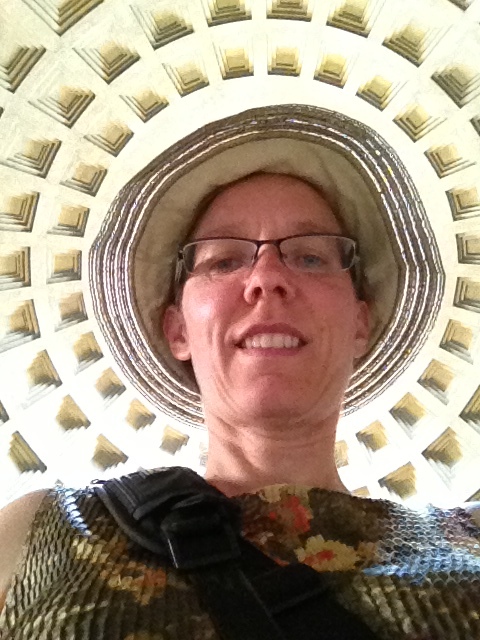 …I headed east for an ice cream at the Frigidarium (2 Euro for two flavors dipped in chocolate!)…. 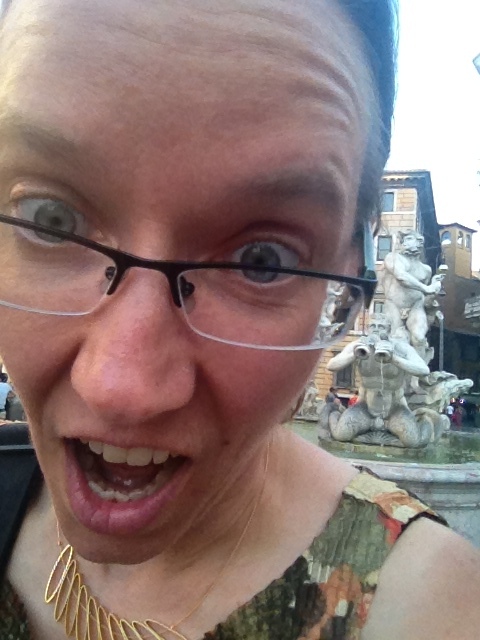 …where I nearly got clubbed by a Roman!